The EGU has named the recipients of the EGU medals and awards 2018. Congratulations to John P. Platt for winning the TS Division's Stephan Mueller Medal and Fabio Corbi for winning the TS Division Outstanding Early Career Scientist Award! They will receive their prizes at the EGU General Assembly 2018 (8–13 April, 2018, Vienna). The next EGU General Assembly 2018 (EGU2018) will be held again at the Austria Center Vienna (ACV) from 08 Apr 2018 to 13 Apr 2018. You are invited to suggest new sessions or modify the existing skeleton program sessions. Remember to nominate an outstanding colleague or student for the Stephan Mueller Medal or the Outstanding Early Carrer Scientist Award. The deadline is on June 15. The dead-line for the submission of nominations for the Stephan Müller Medal 2018 is coming up on June 15th. Please consider nominating a colleague whose scientific work represents an outstanding contribution to Structural Geology, Tectonics and Lithospheric Geophysics. Cees Passchier won the Stephan Mueller Medal 2017! At the 2017 General Assembly Cees W. Passchier was awarded with the 2017 Stephan Mueller Medal in recognition of his fundamental contributions to the understanding of deformation in rocks at all scales through innovative tools such as kinematic indicators, microstructural criteria, and vorticity analysis. Congratulations! With a little delay we note that the 2017 General Assembly again broke records with 14,500 participants and 17,400 presentations. Also for TS this was a very successful meeting with an all-time record of 960 abstracts in 32 sessions that were led by TS (and over 1500 abstracts if we include co-organised sessions). We would like to thank you all for helping make this meeting such a success and we hope you enjoyed it as much as the TS team did! Please fill out the questionnaire at and/or drop us a mail at ts@egu.eu for any division-related feedback - positive or negative, we need your input to keep improving our programme! While the aftermath of EGU 2017 is still in our minds, the new TS team led by TS Division president Claudio Rosenberg will now slowly start to get to work for EGU 2018. This summer, another EGU Summer School takes place. Giorgio Pennacchioni and Neil Mancktelow organise this great event from August 25 to 31 in northern Italy. More information can be found here. The programme for this year's EGU General Assembly is online! The assembly takes place from April 23 to April 28 in Vienna, Austria. Check out the programme for the TS Division. You can also download the TS programme as a convenient pdf-file. We are looking for a new officer to be in charge of the "News & Media" for our TS Division, replacing Marcel Frehner, who was looking after this over the past years. The task of the News & Media officer is to keep the media of the TS Division attractive and updated, advertising interesting events for the TS community. Information about conferences, courses, publications, and special events should be posted on the website, Facebook, and twitter. The News & Media officer will work closely with the president, early career scientists, and the programme committee of the TS Division to collect information to be posted. Interested candidates should send an e-mail to Claudio Rosenberg and/or Susanne Buiter with a very short description of yourself and a few lines about your motivation. In 2017, the most prestigious medal of our TS division, the Stephan Mueller Medal, will be awarded to Cees Passchier from the University of Mainz. João Duarte from the University of Lisbon will receive the Arne Richter Award. That means that João was the TS Division Outstanding Early Career Scientist Awardee and was then selected as one of four Arne Richter Awardees on the EGU level. We congratulate both awardees. They will receive their awards at the 2017 EGU General Assembly, which takes place on April 23-28 in Vienna. More information about all 2017 EGU awardees can be found here. We're very happy to welcome Claudio Rosenberg as our new TS Division president. He was elected with 55.1% of the online votes. Congratulations to Claudio. Claudio will officially take over from Susanne Buiter during the EGU General Assembly, which takes place in April 2017. Our division president, Susanne Buiter, is stepping down after four years of very active service to our community. We thank Susanne for her work and effort that she put into her presidency. It has really been a very productive time with her at the top of the TS division. Now it's time to elect a new TS division president. There are two official candidates running for that job. Every EGU member can participate in the elections and you should have received a personal e-mail with all necessary information. Maybe, this is also a reason to become an EGU member? More information about the election can be found here. The call-for-abstracts for the EGU 2017 General Assembly is now open! To submit an abstract, browse through the proposed sessions and simply click the submit-link in the session where your abstract fits best. The EGU 2017 General Assembly will be held in Vienna from 23-28 April 2017 and abstracts can be submitted until 11 January 2017. Also note that for support applications, abstracts have to be submitted already by 1 December 2016. We are very happy to announce that from now on, we also have our own EGU blog! With this blog we would like to provide a platform for exchanging thoughts and ideas within the global tectonics and structural geology community. Check it out! The blog is maintained by Eleonora van Rijsingen en Mehmet Kokün, and they take guest editors on board too! So if you have an idea, share it with Mehmet and Eleonora. Enjoy! The EGU 2017 General Assembly will be held in Vienna from 23-28 April 2017 and the call-for-sessions will be open until 9 September 2016. The scientific sessions are largely organized bottom-up; hence it's now your chance to propose sessions that you think are interesting to the TS community. Please have a look at the already proposed sessions to see where you could contribute with a new session for the TS programme. We hope that you will see great opportunities for new session proposals! Please also consult the TS convener guidelines to see what your job as a session convener will be. Right now, the only effort required is to provide a session title, the names of 2-3 conveners, and a (short) session description. If you would like to discuss a possible session, please just contact us in the TS programme committee. EGU awards a range of medals and awards in all its different subject areas. On the division level, the TS Division knows two main awards: the Stephan Mueller Medal for mid-career scientists and the Division Outstanding Early Career Scientist Award for early career scientists. It is up to the community (i.e., you) to nominate scientists for these two awards. The nomination deadline is June 15. So, we invite you to propose individuals you consider deserving an EGU award. The nomination procedure is simple and should not take too much of your time. 21. 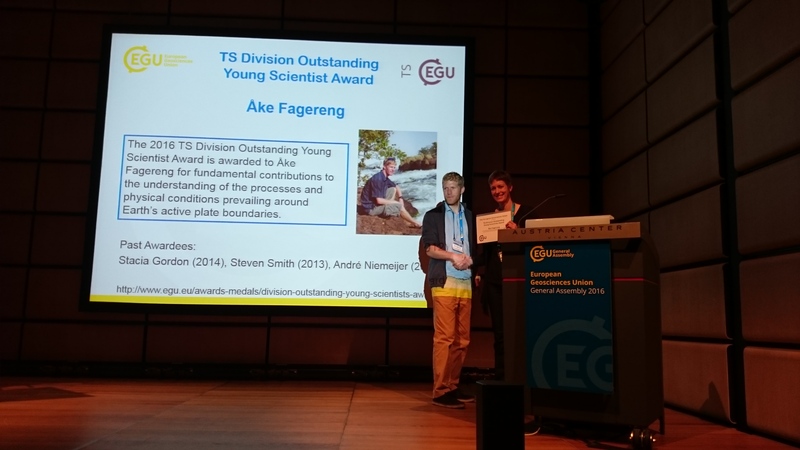 May 2016 Åke Fagereng receiving the TS Division Outstanding Early Career Scientists Award at the EGU General Assembly. We also want to congratulate again Åke Fagereng for receiving the well-deserved TS Division Outstanding Early Career Scientists Award. Åke gave his award lecture exactly one month ago at the 2016 EGU General Assembly. His talk entitled "What major faults look like, and why this matters for lithospheric dynamics" attracted a large number of listeners. 19. 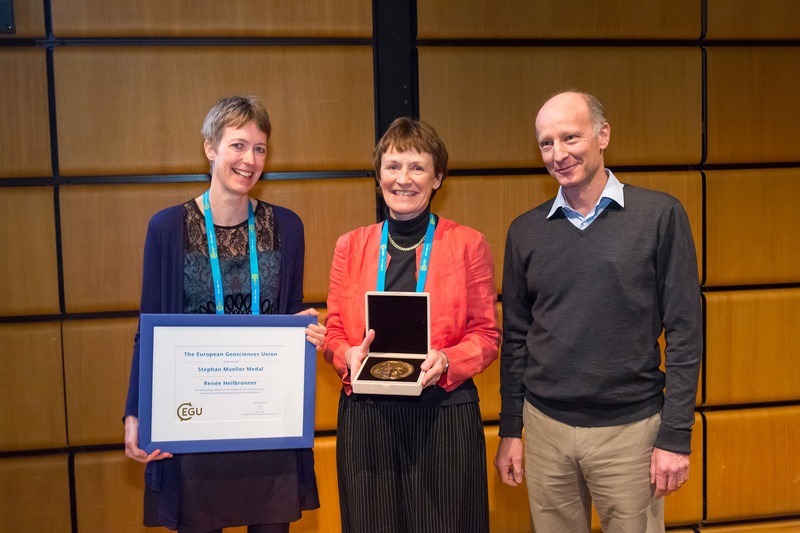 May 2016 Renée Heilbronner receiving the 2016 Stephan Mueller medal at the EGU General Assembly. We want to take the opportunity to again congratulate Renée Heilbronner for receiving the 2016 Stephan Mueller Medal. Renée has received the Medal at the EGU General Assembly and delivered a very interesting medal lecture on Tuesday entitled "Deformation of the lithosphere and what microstructures can tell us about it". The lecture room was intended for 670 people and was totally packed with people. The General Assembly 2016 was the largest ever with over 16,000 presentations. We would love to hear your feedback! Please fill out the questionnaire at www.egu2016.eu/feedback and/or drop us a mail at ts@egu.eu for any division-related feedback - positive or negative, we need your input to keep improving our programme! As of today, the scientific program of this year's EGU General Assembly is online. Together with all session conveners, we are very happy to present a very interesting program across all disciplines related to structural geology and tectonics. Go to our session program. The abstract submission deadline has passed and the programm committee together with the session conveners is arranging the sessions during several organization phases. So far, we received 759 abstracts in sessions on which TS has the lead and another 619 abstracts in sessions that we co-organize with other EGU divisions. These numbers are very similar to previous years if we consider that 3 of our TS-led sessions have become an Interdisciplinary Event and their abstracts (82 total) are not included in our count. IEs are new as of 2016 and an overview can be found here. However, these numbers may change a bit during the session organization phase. You will receive the letter of abstract acceptance on 01. February and the final program will be announced on 02. March. Stay tuned. The call for short courses for EGU 2016 is now open. This means that you can propose short courses on a specific subject/technique/software that will then take place during the EGU conference 2016. At the same time, you can now also book splinter meetings and townhall meetings, which can be, for example, meetings of European projects or specialist groups. Today the Call-for-Abstracts for the EGU General Assbemly 2016 opened. The assembly takes place 17.-22. April 2016 in Vienna. Together with all session conveners, we are excited to present a very interesting TS-program for 2016 with both traditional and novel session proposals. Now it is up to you to submit your work and fill the program with content. Check out our program here to find out to which session your work fits best. Renée Heilbronner (University of Basel) will be awarded the Stephan Mueller medal for her outstanding research on the analysis of rock micro-structures and textures and the quantification of rock deformation. Åke Fagereng (Cardiff University) will receive the TS Division Outstanding Young Scientist Award for fundamental contributions to the understanding of the processes and physical conditions prevailing around Earth's active plate boundaries. Congratulations to the two awardees. You can find the official EGU announcement here. For the EGU General Assembly 2016 (17–22 April), the Call-for-Sessions is now open. The deadline for session proposals is 18 September. As EGU maintains a bottom-up organization, everybody can propose sessions that she or he thinks is worth organizing. So, it is up to the community to come up with ideas and to finally put together a great program. Find the TS convener guidelines here. Our division co-organizes sessions at both the GSA Annual Meeting in Baltimore (1-4 November 2015) and at the AGU Fall Meeting in San Francisco (14-18 December 2015). The 2015 Outstanding Student Poster (OSP) Award for the TS division has been awarded to Hans Jørgen Kjøll from the Norwegian University of Science and Technology. His poster was entitled "Brittle-viscous deformation of vein quartz under fluid-rich low greenschist facies conditions" by Hans Jørgen Kjøll, Giulio Viola, Luca Menegon and Bjørn Eske Sørensen. Read Hans' abstract here. We congratulate Hans for his excellent contribution to the EGU General Assembly and to geosciences in general. The call for nominations for both the TS Young Scientist Award and the Stephan Mueller Medal is still open until June 15. Please consider nominating colleagues who deserve such an award. The nomination procedure is quite simple. All necessary information can be found here. The 2015 EGU General Assembly is past. We think it was a great meeting with lots of very interesting presentations and discussions. Now it is up to you to provide us with your feedback, so we can do things even better next year. Please use the online feedback form here. We highly appreciate your participation. Registration for the third EGU Summer School on the Structural Analysis of Crystalline Rocks is now open. It will take place from the 23rd to the 29th of August 2015. Register quickly as places are limited. Here you find all information including information about registration. GREAT NEWS: Right in time for the EGU General Assembly, we have two new young scientist representatives: Anne Pluymakers and João Duarte. We warmly welcome the two in our TS Division team. We are organising a short course "How to write a successful ERC Starting Grant proposal" in collaboration with ERC members and past starting grant winners, who will share their experiences in the ERC programme, propsal writing, interviewing and reviewing. SC19/TS10.1 "How to write a successful ERC Starting Grant proposal"
The 2015 meeting program of the EGU General Assembly went online today. In our division, we have a whole range of different topics covered by various oral, poster, and PICO sessions. We are very excited about this superb program. Check it out here. The recent Geotalk features our 2014 TS Outstanding Young Scientist, Stacia Gordon. She talk about her career steps and provides some insight into her current research. Geotalk is an EGU-run online blog introducing early-career researchers. Here you find the blog about Stacia. The Stephan Mueller Medal is the award of the TS division to recognize outstanding contributions to Tectonics and Lithospheric Geophysics. In 2015, this prestigious medal will be awarded to Evgueni Burov from the University Pierre and Marie Curie, Paris. More information and all other EGU awardees can be found here. We congratulate Evgueni to the 2015 Stephan Mueller Medal. The place and date of the next Emile Argand Conference on Alpine Geological Studies are now set: 13–20 September 2015 in Briancon in the French Alps. The organisers are Christian Sue, Stephane Guillot, and Gianreto Manatschal and the workshop will include several field excursions. More information and a link to the conference homepage will follow soon. A total of 123 students applied for the Outstanding Student Poster (OSP) Award of the TS Division. After all evaluation forms have been handed in and reviewed, we are happy to announce that the 2014 OSP Award goes to Adina E. Pusok of the University of Mainz for her outstanding poster: "The development of topographic plateaus in an India-Asia-like collision zone using 3D numerical simulations". Congratulations to Adina. Her EGU abstract can be found here. The call-for-sessions for the EGU General Assembly 2015 has just opened and we are now soliciting your help to achieve an attractive session program! The TS division works bottom-up, meaning that it is up to the community and to individual members to suggest and convene sessions. We are sure that there are many great opportunities for new session proposals. Click here to see the sessions proposed so far and to suggest new sessions. Click here to check the tasks and a rough schedule for session conveners. At the last EGU General Assembly, the opinions about a TS-Facebook-page were quite diverse. While the enthusiasm at the official TS meeting was very limited, the young scientists were very much in favor of such a page. We decided to follow the young scientists. You can find our brand new TS-Facebook-page here. Like it... share it... spread the word. Following the EGU General Assembly, there will a Special Volume on Deformation Mechanisms and Strain Localization, which is going to be published in Solid Earth. The Special Volume provides an overview of recent advances in the study of deformation mechanisms and microstructures and the process of ductile strain localization in the lithosphere. Microstructures and textures (crystallographic preferred orientations) represent the link between natural and experimental rock deformation, allowing extrapolation and application of laboratory data to natural shear zones and rock rheology. The investigation of progressive microstructural development and related deformation mechanisms in shear zones is therefore of prime importance for understanding strain localization, which occurs throughout the lithosphere and determines the lithospheric strength and general geodynamic processes. Recent contributions have highlighted the interactions between fracturing and ductile deformation under a wide range of P and T conditions, as well as the importance of planar rheological heterogeneities for shear zone localization in the crust and mantle. These aspects need to be further explored in order to achieve a quantitative understanding of the mechanical behavior of the lithosphere and of the resulting distribution of deformation. The Special Volume welcomes (but is not limited to) contributions presented at the session “Ductile deformation and its interaction with brittle fracture: fabrics, strain localization, fluid-rock interaction and metamorphic conditions” at the EGU General Assembly 2014, and aims to present a mix of both review papers and original research studies. Please express your interest to submit an article to this special volume until 10th June 2014 to luca.menegon@plymouth.ac.uk. The call for our two division medals is now open. This is on on hand the Stephan Mueller Medal, which is awarded to mid-career scientists in recognition of their outstanding contributions to tectonics and lithospheric geophysics. On the other hand, the TS division awards the Outstanding Young Scientist Award, which recognises scientific achievements in the field of structural geology and tectonics, made by a young scientist. More details can be found here. Proposing a suitable candidate for one of these prestigious medals is easy. Nomination guidelines and the nomination procedure can be found here. This year's EGU General Assembly has just finished and the TS-program was again a great success. We led 27 sessions, where a total of 868 abstracts were presented (1810 abstracts if we include co-organised sessions). The Stephan Mueller medal lecture by Claudio Faccenna on Tuesday morning was extremely well attended demonstrating the size of our community. This year, we also held the first TS young scientist meeting on Thursday evening, which was organized by our new young scientist representative Charlotte Fillon. There will definitely be an increasing young scientist activity within the TS division in the future. We want to thank everyone who actively participated in the EGU General Assembly 2014: authors, session conveners, and the TS program committee. It is thanks to all these people that the EGU General Assembly can be such a success. We warmly welcome our new Young Scientist Officer, Charlotte Fillon from the Instituto de Ciencias de la Tierra "Jaume Almera" CSIC in Barcelona. Charlotte will coordinate the TS activities for young scientists, starting at the upcoming EGU General Assembly in Vienna. Ever been looking for a great picture to illustrate your work? Have a look at imaggeo! Imaggeo is EGU’s online open access geosciences image repository. Everyone can submit their photographs and videos to this repository and, since it is open access, these images can be used for free by scientists for their presentations or publications, by educators and the general public, and some images can even be used freely for commercial purposes. Imaggeo is also always looking for new great contributions, so please see if you could contribute! More about imaggeo can be found here including a map overview of the images. Daniel Garcia-Castellanos (Institute of Earth Sciences of Barcelona) summarized The Outstanding Open Questions in Geoscience in his blog. It is a very interesting compilation, but because it is most probably not complete, Daniel is looking forward to receive comments and suggestions. We are pleased to announce our new collaborations with the AGU-Tectonophysics section and the Structural Geology and Tectonics division of GSA! Starting from the 2014 EGU General Assembly (more info), we will co-sponsor two to four sessions at our respective annual meetings, but we are open to suggestions for other means of widening the scope of such collaborations. The TS Division is looking for a young Earth scientist to work with us in setting up a TS young scientist network, help with involving young scientists in sessions, and represent TS in the EGU young scientist platform. Please contact Susanne Buiter (ts@egu.eu) if you could see yourself in this role. The call for abstracts for the EGU General Assembly 2014 is now open until 16. January 2014. The EGU General Assembly takes place from 27. April - 2. March 2014 in Vienna, Austria. You can submit your abstract directly to one of the proposed session. All TS sessions can be found here. We are very delighted to announce the awardees of the two TS medals, which will be handed over at the EGU General Assembly 2014. We congratulate the two awardees. A press release from EGU can be found here. Last year's TS division outstanding young scientist, André Niemeijer won the highly competitive ERC starting grant for his research on earthquake nucleation processes. A press release of the University of Utrecht can be found here. The TS community congratulates André and wishes him all the best for his future research. We build our scientific meeting programme on the basis of sessions suggested by the community and your input is therefore crucial to a solid and exciting programme. The open Call-for-Session-Proposals is now open until 13. September. Use this opportunity to propose a session for the next EGU General Assembly (27. April - 2. May 2014 in Vienna). You can view the current TS skeleton program and propose sessions here. Please visit this page for some information and guidelines on proposing and organizing a session. We thank Ken and Thomas for their excellent scientific contribution to the TS community and congratulate them on the OSP award. Now, also the new Programme Committee for 2013/14 is complete. We welcome the new members Karen Leever, Marco Herwegh, Matthieu Ferry, and Daniel Garcia-Castellanos. At the same time we thank all the continuing and former members for their great effort in putting together the TS program at the EGU General Assembly. Click here to see the full TS Programme Committee. The abstract submission deadline for the Emile Argand Conference on Alpine Geological Studies (former Workshop on Alpine Geological Studies) is on Monday, 20. May 2013. Click here to go to the conference webpage. The new board of the Tectonics and Structural Geology Division for 2013/14 is complete. We welcome Marcel Frehner to our new board. Click here to see the full board structure. Our new TS president, Susanne Buiter, recognized the importance of an active, lively and up-to-date digital communication. Therefore, the board will have a News & Media officer in the future to ensure a greater visibility of the TS Division. As a first step, the News-section you are currently reading has been installed to keep you up-to-date of TS activities. We invite you to visit us here on a regular basis.